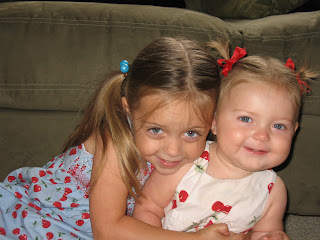 These are our two beautiful girls, Jaeden (3 yrs) and Avery (9 months)! Jaeden loves being a big sister and loves to match her clothes with Avery. She loves doing gymnastics and just started getting into finger paints. Avery is finally getting out of army crawling and has learned to pull-up on things. She can say "Ma-ma", "Da-da", "hi", and "Aiden" for Jaeden. Oh my gosh! They are soo adorable! How lame is this, I've not seen Avery since she was a few weeks old. We NEED to get together. Your girls are soo big and so adorable!!!! YOUR GIRLS ARE BEAUTIFUL!!! I can definitely see Angie, but I can't help but think I see a resemblance of Mary and Lori in your girls, too. I can't believe you're a little mommy, Angie! Best wishes, Haynes Family.